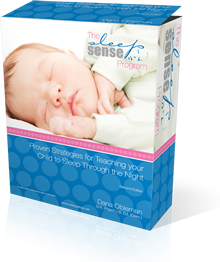 “The Sleep Sense Program.” My best-selling baby and toddler sleep solution. 197 pages. Easy to follow, step-by-step instructions. “Sleep Sense Video Library.” 10 in-depth video lessons that you can watch right on your computer! Subjects include babies, toddlers, older children, naps, and much more. Over 2 hours (127 minutes) of no-nonsense content. “The Sleep Sense Hotline.” A minimum of 3 hours every week where you’ll have access to a live conference call with Dana Obleman. Ask questions, get answers, share advice, or just listen in! “Why didn't we try this sooner?! As we speak he is sound asleep in his crib and has been since 7:15 pm. We are so pleased to get the evenings to ourselves again, and Tinius - who has always been a very happy boy - is even more happy now! “I ordered the sleep sense program and had wonderful results. Tyler slept through the night without any crying by the second night. Thank you for the information, it really helped! !